Recently, I came across an old story from Fogo Island which concerns a spot named Banks (or possibly Banks’s) Meadow. Fogo native Barry Penton informs me that Banks was a Fogo name in the 1800s. According to the Anglican Church Diocesan Records, William Banks, a bachelor of Fogo, married spinster Jane Waterman at St. Andrews Church in Fogo on the 14th of April, 1844. “The last record I have of is John Banks in 1883, who was a planter in Back Cove,” says Penton. Near Back Cove, there is also a Banks Cove. And given the family was in that area, it is likely the meadow was named after a member of the Banks clan. One evening in the early part of the twentieth century, a girl and her aunt were going to a meeting. Flashlight in hand, they followed the path up through Banks Meadow. When they got part way across the meadow, they saw a man. He had a little short coat on, like men wore at that time. As it was a cold night, he had the collar turned up. “There’s a man there,” said the girl, pointing him out to the aunt. When they drew near him, the girl spoke to the man. “Good night, sir,” she called out, but he did not answer. The girl made to step one way, and he stepped back. The women passed by, and the girl looked behind them. The man was still there, standing still. She looked back again, and he was still there. When the girl looked back a third time, the man had vanished from the middle of the meadow. “Aunt Liz, that man is gone!” she cried. “Oh no!” said the aunt. “Oh yes he is, he’s gone,” said the girl. At that point, the two women made their way through the meadow, as fast as they could. At that time, many people in the cove claimed to have seen the man in the meadow. It was said that he was more like a shadow than a man. Even those who got close to him could not recognize any features. One night in winter the same girl was heading home, alone. The snow lay crisp and undinted. As the girl came up to the meadow, there was not a footprint to be seen in the snow. She could see the lights in the houses of the cove, and could hear dogs barking, but for some strange reason, she couldn’t find the path to get home. No matter which way she turned, she couldn’t seem to find the path across the meadow. She turned around and went back to the place she had started from. Then she set out a second time, with the same result. When she got to the meadow, there was not a footprint anywhere, and no matter what she tried, she couldn’t find the path. The girl went back down to her cousin’s house instead. The cousin walked her back up to the meadow, and when they got there, they found that the snow was all trampled to pieces, just to one side of the path. 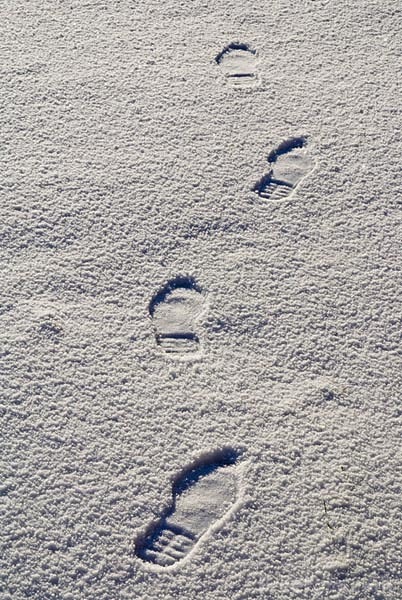 When the girl looked, she saw a set of man’s footprints alongside her own. The cousin got the girl home safely, and she put the incident out of her mind. A week later, however, she was visiting the home of the only woman in the cove to have a radio. A group had gathered to listen to the radio, and were telling stories. The group started talking about a man who got lost coming up across the meadow the week before. He had crossed it many times, but nothing strange had ever happened before. The girl asked when he had gotten lost, and discovered he had tried to cross it just before she had. “He wasn’t the only one,” she told the crowd, and then shared her strange tale. The girl’s father told her that there had been a grave there on the meadow at one point, but that nothing remained to mark it. If you know a story about Banks Meadow, or have heard of the ghost on the path, write to me at info@hauntedhike.com.